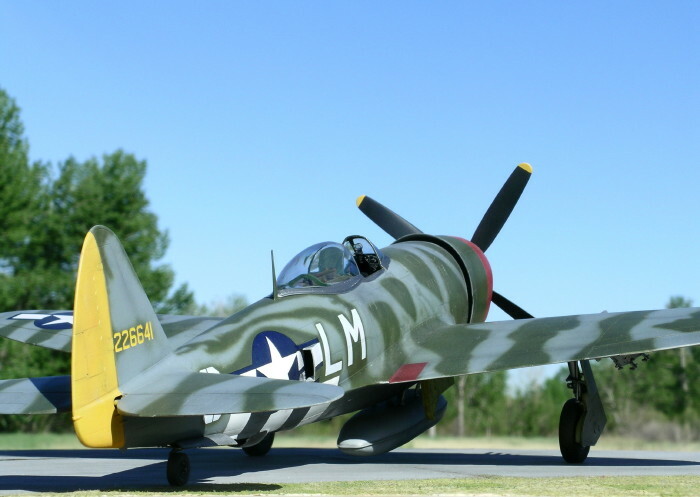 Hasegawa’s 1/32 P-47D is a welcome addition to the growing number of large scale model aircraft on the market. As with most Hasegawa kits, the model strikes an excellent balance between detail, simplicity, and straightforward design, and it is considerably cheaper than its Trumpeter counterpart. The surfaces have finely engraved panel lines, and rivet details are kept to a minimum. 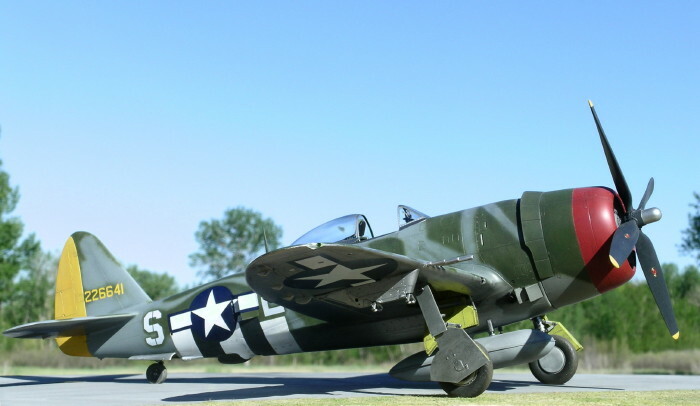 I decided to build my P-47 in the well known markings of Lt. Col. David Schilling’s “Hairless Joe”, 56th FG, Boxted England. 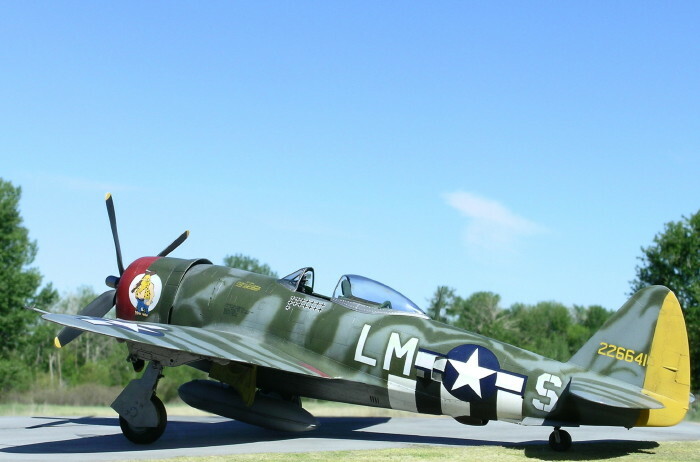 I opted for one of the earlier phases of this aircraft’s service life, defined primarily by the stenciled “S” on the fuselage, solid serial numbers on the tail, as well as some subtle details of camouflage on the tail and rear fuselage. Cutting Edge produced both the early and late markings for this aircraft in decal sheet #32086 (out of production now that Meteor has closed its doors). 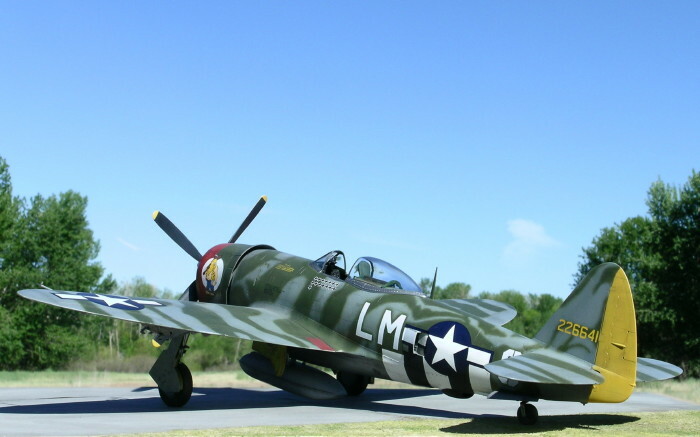 Markings for the later version of “Hairless Joe” are produced by LSP (Large Scale Planes). One could use the LSP decals as the basis for the early version, but the name plate would be incorrect and new serials would be required. Modifying the “S” would be a minor task. The kit is a straightforward build and offers no major hurdles. 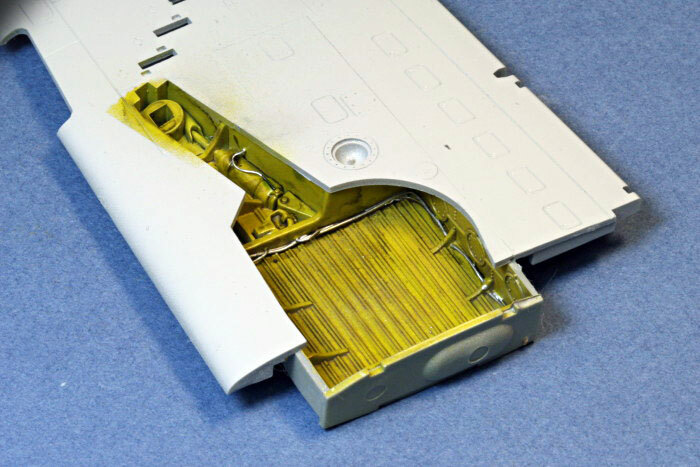 There are some sink marks on the upper wing surfaces that need to be filled and sanded, but this issue is simple to address. The fit of the cowl is a bit off, creating in a small step across the transition from cowl to main fuselage. This misalignment can be corrected by shaving off some plastic on the top of the plug that receives the cowl assembly on the fuselage. 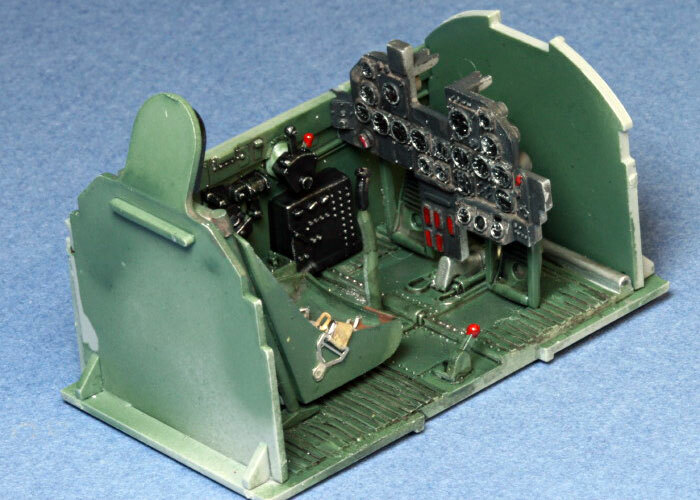 The cockpit in the Hasegawa kit has a smooth floor characteristic of the P-47D-30 and later models. However, Schilling’s aircraft was a D-25, so it was necessary to add corrugations to the cockpit floor. I used strip styrene to make this modification, although one could also purchase the highly detail resin cockpit (early version) by Avionix (item #32047). I painted the cockpit Dark Dull Green using a mixture of Polly Scale RAAF Foliage Green and a touch of RLM 67 Dark Olive Green as an approximation. Seatbelts were made from lead foil with photoetch buckles. 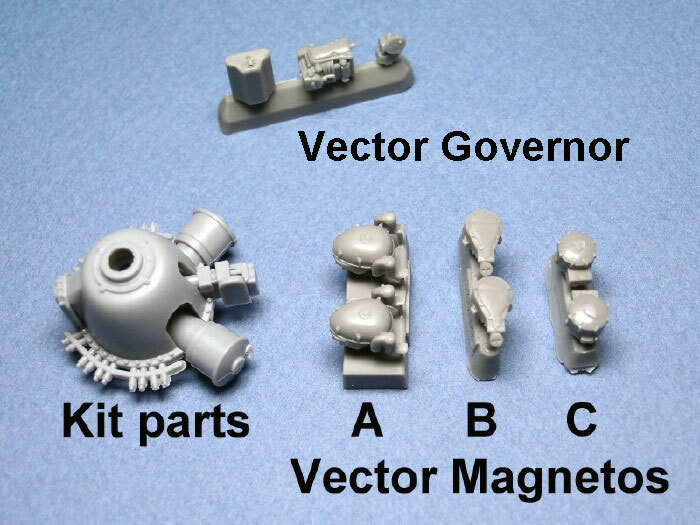 The kit engine is reasonably well detailed, but the magnetos are an unusual (mysterious?) 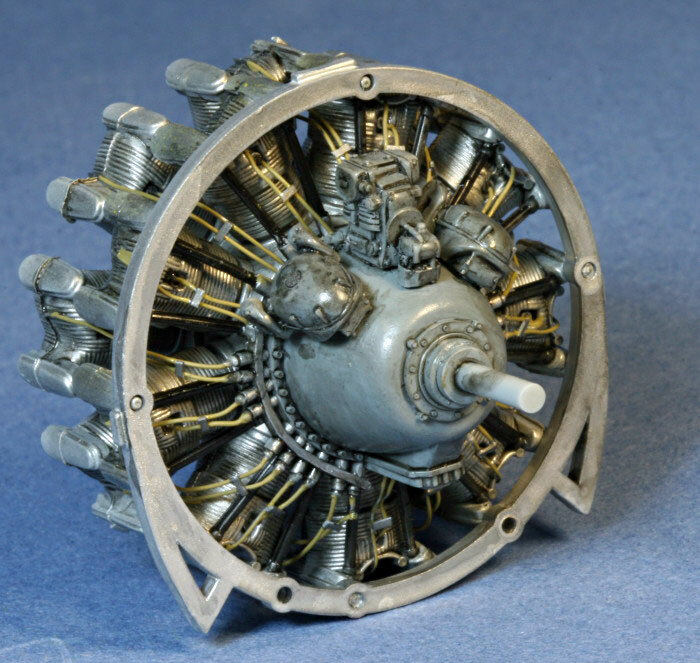 shape so I replaced them with one of the three types of magnetos supplied in the resin R-2800 engine by Vector (I used magneto “A”, shown below). I also used Vector’s governor, and I wired the engine using fine solder wire. The wheel wells and interior surfaces of the gear covers were painted with Misterkit yellow zinc chromate primer. The inside of the cowl was painted Alclad II Duraluminum. The wingtip lights on the kit parts are molded in solid styrene, so I cut these areas out and replaced then with custom parts fashioned from clear sprue. 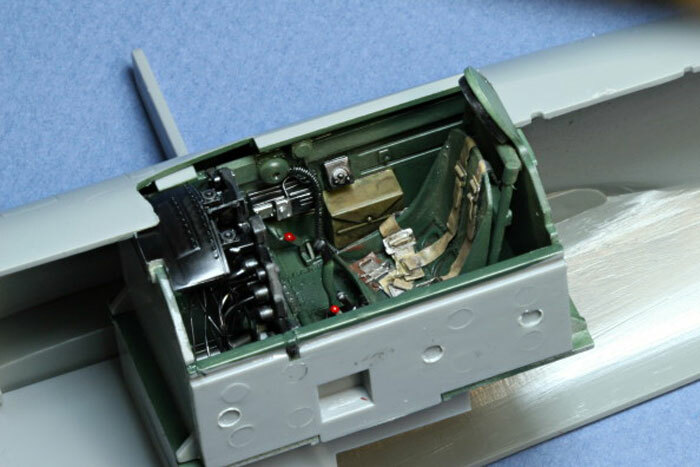 A hole was drilled in the interior surface of each wingtip light so that I could add a drop of Tamiya clear red (port side) or green (starboard side). I used Hasegawa’s brass replacement machine gun barrels, but they became more hassle than they were worth. I carefully primed and painted the barrels with Alclad aluminum, but when I inserted them into the holes on the wing the paint scraped off and bunched up at the base. Removing this mess chipped the paint on the barrels, and I was forced to re-prime and spray the barrels while they were attached to the model. Next time I will hollow out the tips of the kit guns, paint them by hand using Model Master metalizer, and call it a day. 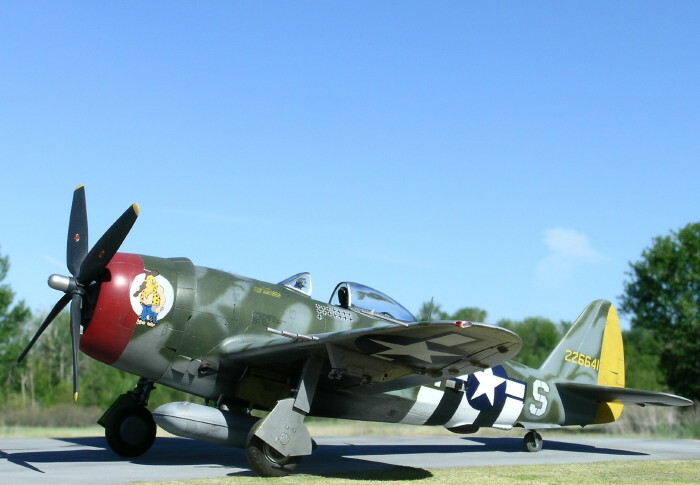 As the Allies prepared to invade continental Europe in mid-1944, concerns were raised that USAAF aircraft in natural metal finishes would be easy for German airmen to spot on the ground at forward air bases. 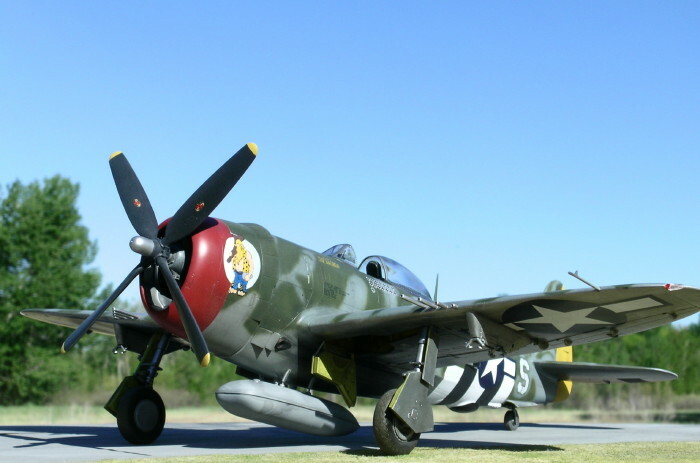 As a result, many Eighth Air Force fighters received in-the-field camouflage consisting of solid green upper surfaces or, as in the case of Schilling’s mount, a combination of green and grey. 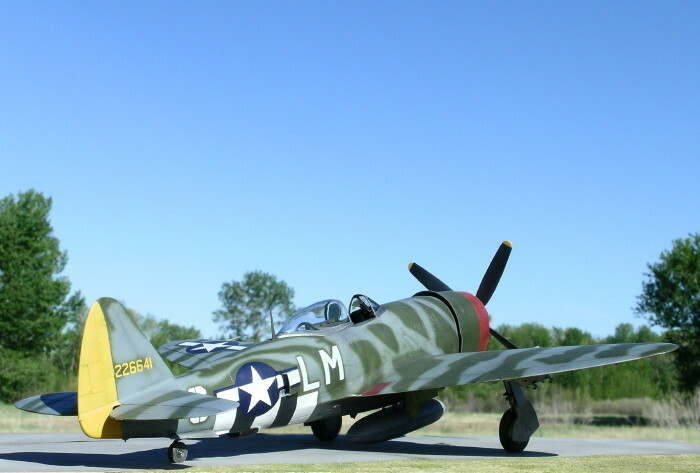 By most accounts Schilling’s aircraft was painted in a disruptive camouflage of RAF medium sea gray and dark green, with the undersides remaining natural metal. Note that the underside of the cowl appears to be neutral gray or something similar. “Hairless Joe” is well documented in color and grayscale photographs, but the majority of these photos are of the port side. The one published photograph (that I know of) of the starboard side shows the front of the aircraft in detail, but the rear fuselage and tail are obscured by the wing. The upper surfaces of “Hairless Joe” have also been a source of mystery, leaving decal manufacturers to speculate blindly on the pattern. 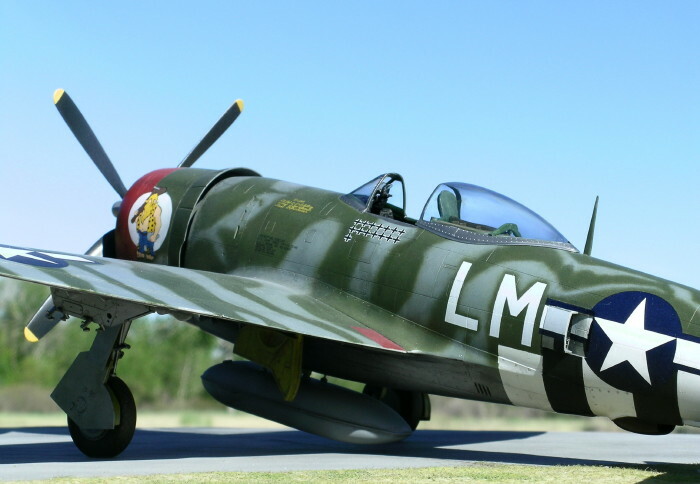 However, I came across a remarkably clear photo of the upper surfaces on page 49 in the recently published Warpaint Special #1 “Republic P-47 Thunderbolt” by Hall Park Books. This photo shows the camouflage pattern on the entire port wing and port stabilizer, as well as the outer third of the starboard wing. 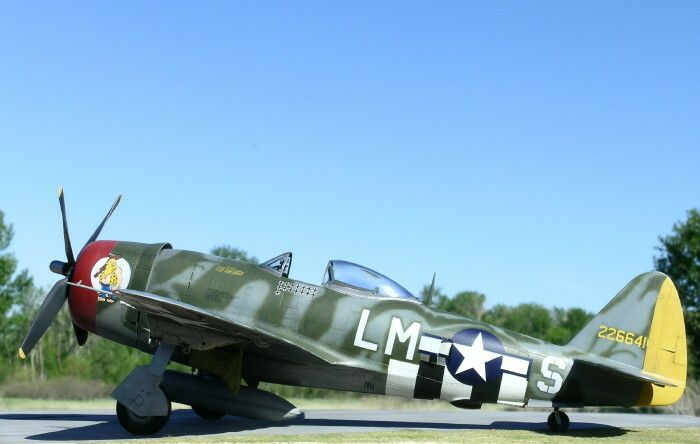 There is no doubt as to the identity of the aircraft because the nose art is visible, as is the unique camouflage pattern on the port fuselage. After priming the model using Tamiya’s Fine Light Gray Surface Primer in a rattle can, I painted and masked the invasion stripes, rudder, and cowl band. I then sprayed the undersurfaces duraluminum using Alclad II metalizer. I applied dark washes of highly thinned Tamiya black acrylic to give a more natural look to the metal. For the upper camouflage I used Xtracrylix RAF Medium Sea Gray and RAF Dark Green. 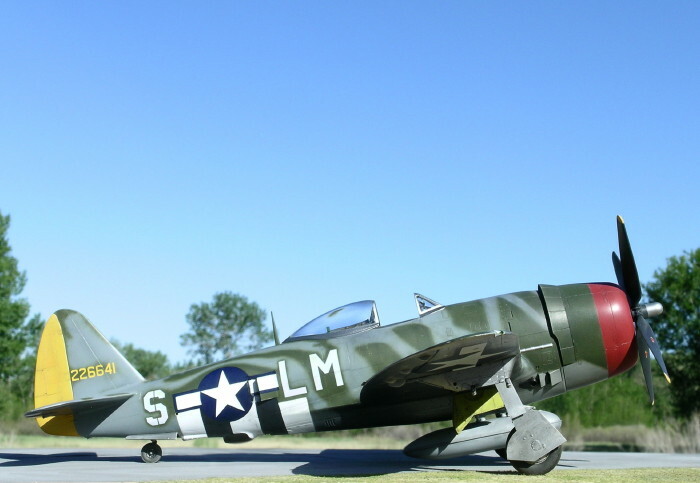 Photos indicate that the letter codes were applied to a solid dark green surface, and that the disruptive gray pattern was applied afterward - the fuselage codes are surrounding by dark green trim, and the photo of the starboard side of the aircraft shows uneven streaks of gray paint beneath the cockpit. 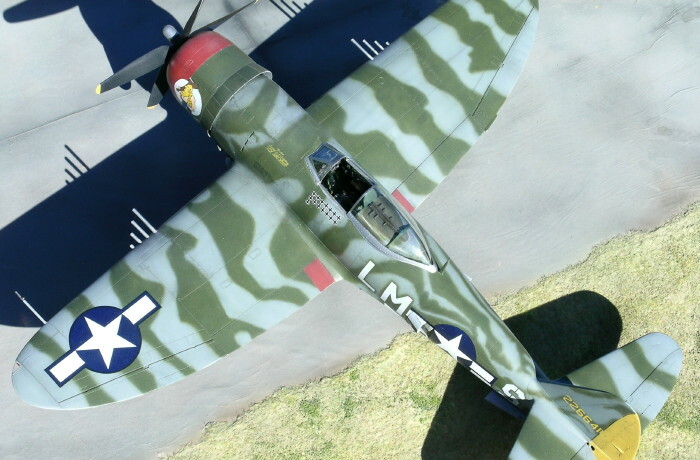 To match this effect I painted the fuselage dark green, applied masks of the letter codes to the model, and then painted the gray disruptive camouflage scheme. Dark green trim was left around each letter. In retrospect I should have painted and masked the white letter codes on the fuselage instead of using the Cutting Edge decals; the white decals were disappointingly translucent. I used Eagle Editions decals for the stars and bars on the fuselage and upper wing, but relied on the Cutting Edge decals for the oversized stars and bars on the lower wings. The serial numbers, kill markings, and name plate were used from the Cutting Edge decal sheet. Note that the Cutting Edge instructions incorrectly show Schilling’s aircraft with a Curtiss Electric propeller and hub; “Hairless Joe” had a Hamilton Standard propeller and hub.